Almost every student, at one point of life, dreams of going abroad for higher education. But that dream isn’t easy to pursue as the college application process is a tedious and tiring one. Nevertheless, the abroad allure often trumps the hassles and hurdles one has to face while preparing to go to college in a foreign land. What do prospective students have to go through in pursuit of quality education? Ashma Chhetri reports. Visiting consultancies became a regular thing for Rishikesh Upadhyay after his grade 12 exams. Like many students who want to go abroad to study after high school, Upadhyay and his friends went to more than 10 consultancies in a day, hoping to find one that would suit their needs. But the puzzling thing, that made them unable to decide which one to trust, was the fact that each of these consultancies had separate lists of colleges that they were affiliated to and would charge an extra Rs 20,000 – 40,000 during the processing period. “When we checked the charges for college applications online, we found that the minimum additional charge that the consultancies around town were asking for was double of what was actually required for the college applications,” says Upadhyay adding that a few consultancies had schemes like free IELTS and SAT preparations and free processing too but these places had low ranking universities on their lists. “My friends and I decided to apply by ourselves and we leave this August,” he says adding that one can easily handle everything that is required to apply for universities and visas but many are hesitant to do so because consultancies paint a picture where if you aren’t letting someone do it for you, you are doomed. However, Upadhyay mentions that you can communicate with colleges of your choice on your own and that the admission officers will assist you throughout the process. When this scribe asked students seeking to study abroad if they were aware of this fact, many confessed that they know about it but still don’t want to take the risk. They would rather have a reputed consultancy (or experts, in their eyes) do what needs to be done. But choosing the right consultancy or deciding to go about it on your own is the least of one’s worries when planning to go abroad to study. An international degree is an expensive undertaking. Students have to think of tuition fees, insurance, accommodation and food, and many other financially taxing matters. Though different banks offer education loans under different schemes, getting a loan apparently isn’t easy. For starters, you must have a house or land that is worth more than your total fees at the college of your choice. 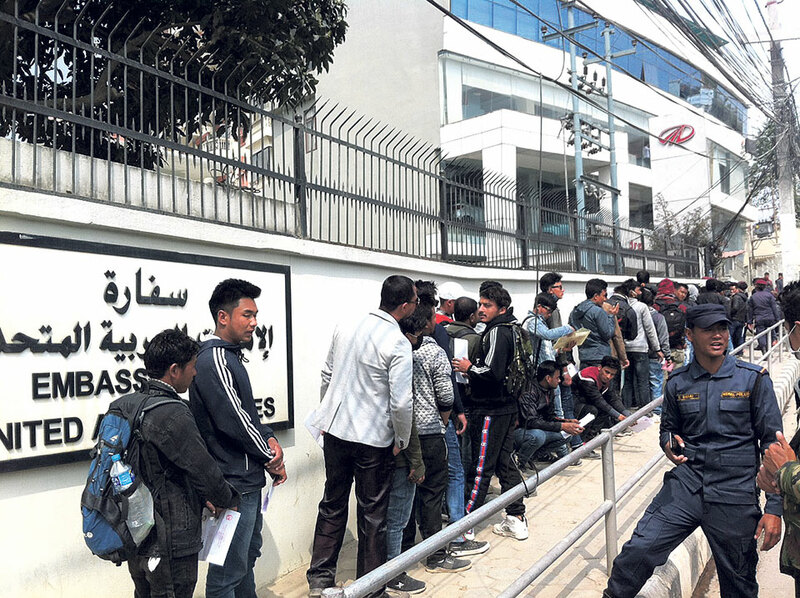 19-year-old, Lalit Chaudhary, who is originally from Malangwa in Sarlahi, shares that since he didn’t have property in Kathmandu and the property his family has back in Sarlahi didn’t come close to the tuition cost, he wasn’t eligible for a loan. “I had the option of getting a loan from one of the many cooperatives that operate in the city but the interest rates were so high that I didn’t think I would be able to repay it later,” he says. On the other hand, his friend Anshu Chhetri* was able to take out a loan to fund her college education in Australia since Chhetri’s family has a house that fit the loan requirements in Kathmandu. But Chhetri will need to pay an interest of 14% on the principal amount for the next year and if she wants to clear her loans before the year is over then she will still need to pay extra money in the name of contract amendment charges and other rules of the bank. Many prospective students like Chhetri were of the mindset that education loans should be more easily accessible and that the government could do something to ensure students don’t crumble beneath the mountain of debt. However, Baikuntha Prasad Aryal, current spokesperson at the Ministry of Education, Science, and Technology, says that people in Nepal don’t take education loans to study abroad. And this infuriates Chhetri who says that this means government authorities assume that only those from affluent families go abroad for quality education. Also, the problem does not end there. Students need multiple official documents from ward offices to be eligible to apply for visa. From income verification to the No Objection Certificate (NOC), making these documents are often tedious tasks. Alisha Rai*, who plans to go abroad to pursue a nursing course, says that she has been running around trying to get her documents in order for three months now. “During my A-levels, my major subjects were Biology, Chemistry, and Mathematics. These subjects make me eligible to pursue Bachelors of Nursing abroad. But, when I applied for the NOC, I was asked for an equivalence letter. When I went to make one, they then said I would need a migration certificate from British Council. After around 15 days, when I finally received both the migration certificate and the equivalence letter, they said they wanted a letter from the Nursing Council of Nepal declaring that though my majors during A-levels do not include physics, I’m allowed to pursue a nursing course abroad,” she explains. Narratives like these are quite common among students who are planning to go abroad and have to visit different government offices for one work or another. Also common are stories of those who get their NOCs in less than a day because they have the right ‘connections’ within the office that process these documents. This scribe met quite a few people who were happily trotting back home, having had their NOCs readied in less than a few hours and met equally many people, if not more, who had been coming back for days in hopes of finally getting their hands on the coveted document. Rai also shared that the consultancy she was using for her college application told her that they would pay the college bills for her, when she was unable to process it through the bank due to delay in getting the NOC. But she would have to pay them back in cash along with an additional amount of over a hundred thousand rupees, which was what they charged to send money abroad. “Then I got a call from an employee at the consultancy who said that for a nominal amount, he could have the additional charges slashed,” says Rai adding that his insistence that they keep this a secret made her not trust him and she chose to pay the extra amount and gave the money directly to the consultancy itself. Some students choose to go abroad for quality education, some to experience independence, away from their families, and some so that they get good job placements post their graduation that will enable them to support their families later on. No matter what their reasons are, going to a foreign country for education is definitely not easy, and the hurdles are aplenty. But the trend to go abroad for higher education doesn’t seem to be waning as prospective students claim that they are willing to go through it all if it means their efforts will somehow pay off in the end, and they get to fly to the destinations of their choices.